»Food In The News»Update – Bring Your Lunch To Work – No Fast Food Today!! On Monday I told you guys that Fast Food workers were doing a 100 city walk out. I contacted Beau Boughamer, one of the organizers of this event. He said that there were planned activities here in Tampa as well. The larger of the two will be in the afternoon at a KFC on Busch Blvd. 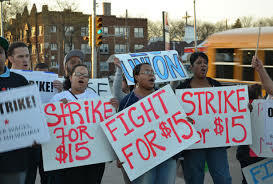 The Florida campaign’s Facebook page is https://www.facebook.com/FLFastfoodworker4fairpay and details on tomorrow’s event are at https://www.facebook.com/events/328695903939610. Show these hard working people some love and support. Pack a lunch today.